The cottage has been converted from part of a detached stone barn and is ideal for a couple or a single, a family or friends with accommodation for up to 4 people. Limoges airport is less than an hour away, with direct flights from 7 UK airports. The cottage faces due south, with a covered private terrace with table & chairs for alfresco dining, plus a BBQ. Downstairs there is an open-plan living-dining-kitchen area with a wood-burning stove, plus the bathroom. A staircase leads directly to a double bedroom in the eaves, with a door leading through to the twin bedroom. The rest of the property consists of a couple of acres of grass & woodlands, plus the farmhouse. You will be sharing the grounds with a number of friendly creatures. 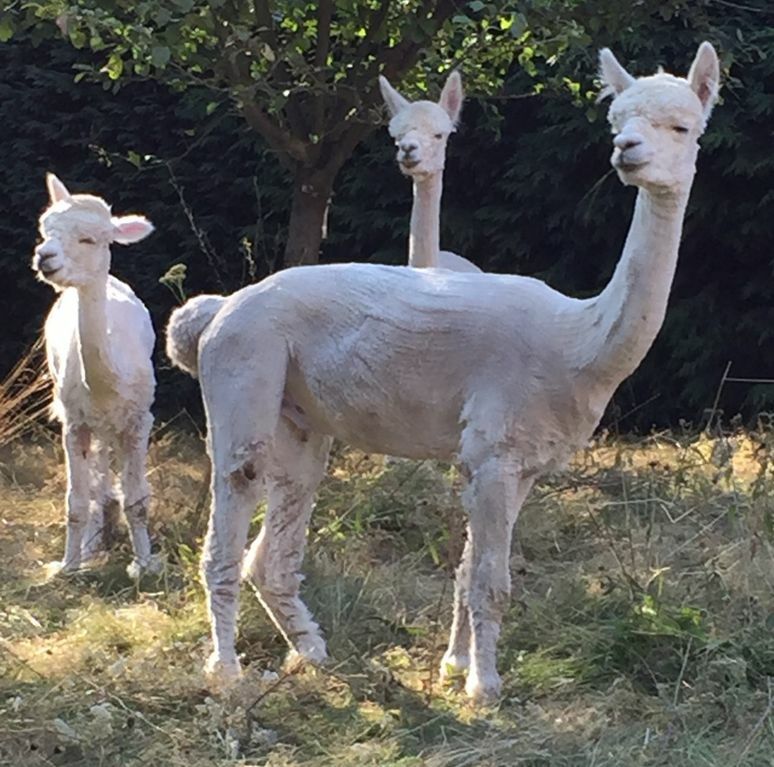 With a handful of chopped apple, you may well find yourself surrounded by a small crowd of friendly alpacas, geese & chickens. But make sure you save some for the very handsome pig. After living & working in London for the majority of my life, I've quit the rat race to try to live "The Good Life" in the French countryside. I moved into the farmhouse here in 2015 with my my cat & my two geese. Since then I've added to the menagerie - more geese, another cat, chickens, guinea fowl, a pig, and of course the three alpacas. My property is in La Creuse, which was described by The Sunday Times as "France's fabulous deepest secret". No extra charge - changed weekly. Covered parking is available for you. No extra charge for bathroom towels - changed weekly. Salt & Pepper. A small selection of herbs & spices. Tea, coffee, milk & sugar for your first day. The kitchen is fully equipped for cooking & dining. DVD player with a selection of 40 DVDs. A selection of books is available - if you are half-way through a book at the end of your stay, please take it with you. And future guests will appreciate any books you can leave behind. Large garden, including an acre of mixed woodland. Large south-facing covered terrace with table & chairs, with views across the valley. Words do not do justice to this property. If you want a tranquil location yet within easy reach of places of interest look no further being located this very small village a mile or so outside Saint- Dizier - Leyrenne. The cottage is very comfortable and well equipped with all you would need for your stay including sun beds. Sam is the perfect hostess, exceptionally helpful without being intrusive and her animals are well worth the trip especially the alpaca's and you won't have seen a bigger pig than Colin the boar. Wildlife abounds with deer, owls, fox, various birds of prey, pheasants and woodpeckers to name a few. Within a day you'll become best friends with Moleskin, the Norweigen Elk Hound. If you fancy spending some time around water, Lac Vassivière is approximately 25 - 30 minutes drive away, with stunning views, numerous man made beaches and restaurants, the perfect way to spend a sunny day. The ancient city of Limoges is about 45 minutes drive away should you be in the need of some retail therapy. All in all this was probably the most relaxing, recharging holiday we've had for a number of years. Thank you Sam, we are looking forward to seeing you next year. Wonderful host, grounds, and cottage! My wife and two young children (ages 7 and 5) spent 4 nights here in early June of 2018. We loved this experience! Our kids loved waking up each day to help Sam out with the animals. Whether it was collecting eggs, feeding the alpacas, or petting Colin the boar, the kids loved it (the adults loved it, too). Simply getting to meet Colin is worth the price of admission! Moleskin the dog was also always around, sometimes coming into the cabin to get some attention from the kids. This was so shocking though. When I asked my daughter who she was going to miss most when we left, she didn't say Colin, Moleskin, or any of the other animals. She said Sam! She really was so wonderful and patient with the kids. While the animals and setting were great, Sam is the glue that makes the property really special. The cottage was very clean and plenty spacious for the four of us. The double bed in the bedroom was really our only complaint, being kind of uncomfortable and small for two grown adults. Sam had plenty of DVDs to watch, the kitchen was very functional, and the bathroom was plenty spacious as well. It sounds kind of cliche, but I would give this place 6 stars if possible. If you and/or your family loves animals, this is the place for you. The wolf sanctuary is only about a 40 minute drive as well for an additional experience. This place will always be in my favorite vacation memories! Thank you. It was an absolute pleasure to meet the four of you & share my life and my animals with you all. I think historically beds in Europe have been smaller than beds in America, and so that's a really good bit of feedback. When I replace the bed, I'll definitely look to get a king-size. We all missed you when you left (Moleskine & Colin particularly so) & I'm chuffed that you enjoyed your stay so much. Loved the place from the minuet we got there. Sam is lovely and very accommodating even the lone of a bottle of red for our first night.....she really can’t do enough for you. The animals are a great addition but Mole the dog steals the show! Would highly recommend 10/10 and would live to visit again. It was great to meet you both & I'm glad you enjoyed your stay with us. It'd be lovely to have you visit here again, we hope to see you soon. This gite is lovely and I can't recommend it enough. Although it's pretty small, the downstairs has a good sized lounge/diner, a medium sized kitchen and a small bathroom and upstairs has two very well sized bedrooms. The setting is perfect, not at all overlooked except for by the main house with great views of forests over rolling hills. The animals are fun and you have free range through the owner's private woodland. If you like rural or are looking to get away from it all for a while you will love this. I came in October and the weather was stunning, a pleasant change since I come from the UK where we rarely see the sun at this time of year! Sam quickly become more of a friend than a supplier and was very responsive to anything I required or any information I needed during my stay. She made the trip an absolute delight and went beyond what I could have expected both in terms of her generosity with her time and with little gifts she'd made in her kitchen. From the moment we arrived, we began to relax into our surroundings. The cottage was more than enough for the two of us. Well equipped for all our needs. Daily visits by the chickens and warm welcome by moleskin the dog was delightful. Getting to feed the rest of the clan was fantastic fun. Full of rustic charm set in the grounds of an old farm house, our party consisted of two adults and three children and there was plenty of room,clean and well maintained. The setting was just perfect, with its own forest to explore and all the lovely animals especially Colin the pig made this a family holiday to remember, Tons to do within the local area from lake swimming to the crazy but very good fun velo rail. Would highly recommend.